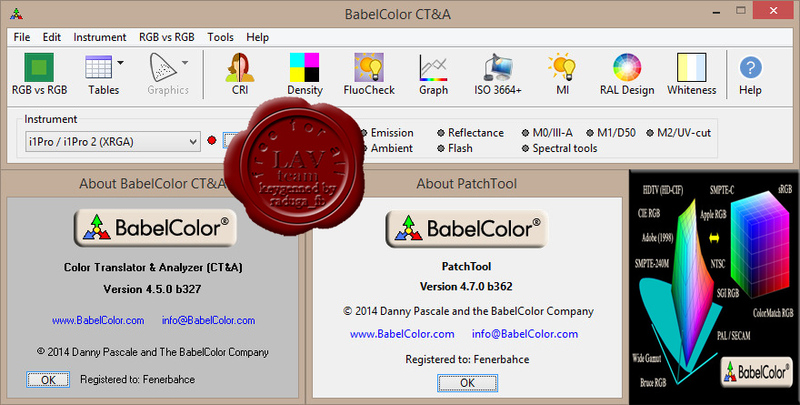 BabelColor CT&A is a collection of tools specifically designed for Color Translation, measurement, & Analysis. Tools are grouped by theme in individually managed windows; these windows are controlled with a menu or a toolbar window. The RGB vs RGB tool is a bidirectional RGB color-space translator and comparator tool. The RGB vs RGB tool accepts manually entered L*a*b* and RGB inputs; it does not require a color measurement instrument although many colorimeters and spectrophotometers can be used to input data (instruments purchased separately; a list of supported instruments is available here). All other tools need spectral data in order to provide results; these tools are collectively called spectral tools. The CRI tools can accept input from an i1Pro or i1Pro 2 fitted with am ambient adapter OR from a file (an instrument is NOT required). All other spectral tools require a connected i1Pro or i1Pro 2 spectrophotometer, manufactured by X-Rite (the FluoCheck tools can only use an i1Pro 2). PatchTool is designed to import, measure, process, and export color lists in a color-managed environment. Import CGATS, CxF1, CxF2, CxF3, text files, and Adobe Swatch Exchange (".ase") files). Extract the colors from a target image. Extract a profile from a file. Open small TIFF files as patches. Perform unconstrained display measurements with the Display-Reader tool. Characterize your display with Display-Check using a built-in set of patches, or patches from any opened color list. Supported instruments: X-Rite i1Display Pro, Eye-OneTM Display, DTP94 (formerly from MonacoOPTIXTM), i1Pro, i1Pro 2; Datacolor Spyder2TM, Spyder3TM, Spyder4TM. Use Patch-Reader tool to measure colors in reflectance with an X-Rite i1Pro or i1Pro 2. Select between three measurements modes: unconstrained measurements; a custom chart with user-assigned rows and columns; or a chart defined by an opened file. With the i1Pro 2, you can select the M0/M1/M2 measurement condition as defined in ISO 13655-2009. Process color lists: re-arrange, average, compare with statistics, profile conversion, substrate/backing conversion. With Gamut Tools you can convert colors using one or two ICC profiles, check if a color list will be clipped by a profile conversion, determine the gamut volume of a profile, and generate fixed pitch color lists.Export to CGATS, plain text, or CxF3 file format. Export to CxF3 compliant files used by X-Rite's i1Profiler (see the detailed CxF3 export specs and Application Note AN-10). Export lists as images, to Adobe Swatch Exchange files, or as as color catalogues (Color Decks) to be used within the BabelColor CT&A program.